One of Cyberium’s programmers has built an amazing website that uses a map to find tunes named after places. Conceived by musician Helen Adam, Tunelines lets visitors search, using a map interface as well as a drop-down menu, for places and, if there is a tune with the name of the place in the title, to download a PDf of the sheet music. Programmer Sam Adam-Day built the site and database, hacking and incorporating the API of Google Maps. Cyberium was able to register the domain name, tunelines.com, despite the fact that the related word, ‘songlines’, is well known. Songlines are an Australian Aboriginal concept documented by the writer Bruce Chatwin. The website is developing, and more tunes will be added over time. 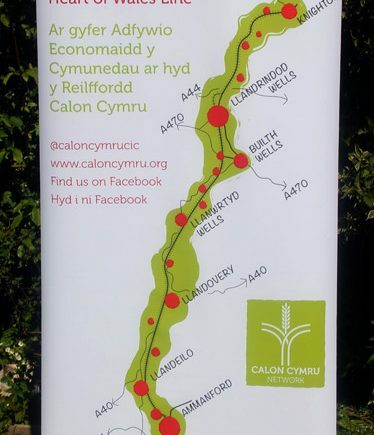 The tunes are free to download but visitors are encouraged to make a PayPal donation to pay Helen, who is researching arranging the music and providing the sheet music. Only traditional folk tunes are included. 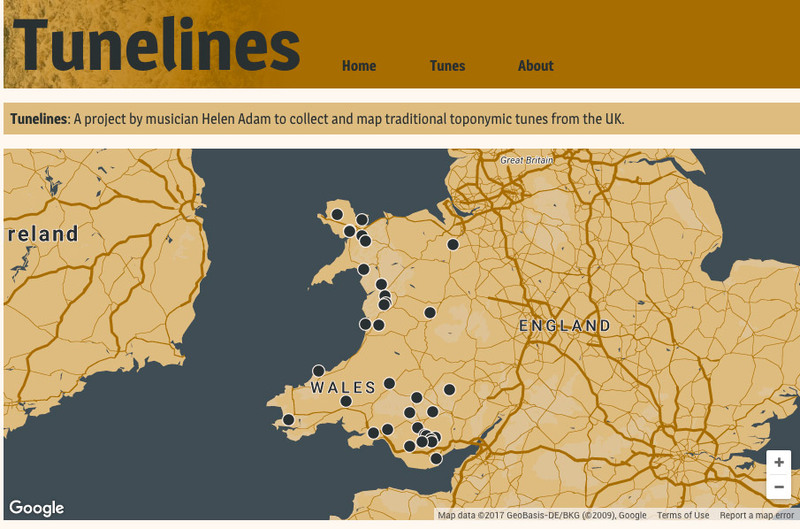 Presently, only Welsh tunes are listed, but eventually it is hoped anyone will be able to suggest a tune from anywhere in the world. If you have a brilliant idea for a website you’d like us to make, get in touch! We’re rather proud of some branding materials we recently designed for a community organisation. 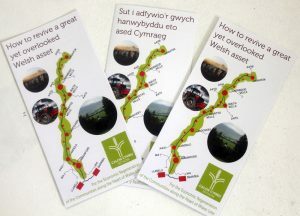 They include bilingual leaflets and pull-up banners. Click on each image for a closer look. If you want any branding or similar promotional materials for your company or organisation, do get in touch. They’ll be cheaper than you might think! Use social media to post updates and news and link back to your site. First brainstorm what keywords people might use to search for your website if they did not know anything about it but wanted the services that you provide. Then try to narrow it down to less than 10. Bear in mind that the people abroad might use different search terms, e.g. ‘vacation ‘ for ‘holiday’. Alt tags are used by search engines when people are searching for pictures. They were originally introduced (and are still used) to give an indication of what is in a picture for the visually impaired who use screen readers to read web pages for them. But conveniently they can also be used to include relevant keywords to drive traffic to your site. Add a description of the photograph using relevant keywords. You can put shortened version in the title field. Repeat this for every image. The main social media are: Facebook, Twitter, LinkedIn, Google+, Instagram, and Pinterest. There are two ways in which social media are used in connection with your website and business: for people to share your webpages with their friends and for you to post news and items of interest so people can follow you and comment. For the first instance, incorporate a plug-in on your website that lets people share pages. For the second, set up social media accounts and add links to them to your website so that people can follow you. You don’t need to use all of these services. Facebook is the most important for some businesses, Twitter for others. For Facebook, post regularly on a page you have set up given the same name as your company and including a link from that page to your website. Back on your website, using a plug-in, have a feed appearing that shows your Facebook posts. A further plug-in allows you to let people follow you on your social media accounts once you have input their URLs. Instagram and Pinterest are good for posting pictures. Google+ and LinkedIn are good for blog posts, special offers and news. Asking questions is a good way to generate conversations. Post reviews on your website, Google, and Facebook and invite feedback. Contact us for more help in improving your search engine positioning. 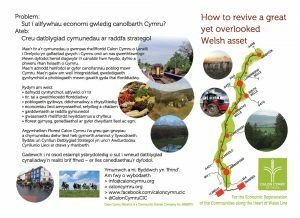 Cyberium has made a website in Welsh and English for the arts, history and cultural centre of Llanwrtyd. It incorporates video and picture galleries to bring alive this valuable cultural asset, recently opened following the refurbishment of an old chapel in the centre of the town. The town was once a major tourist attraction because it was a spa town. 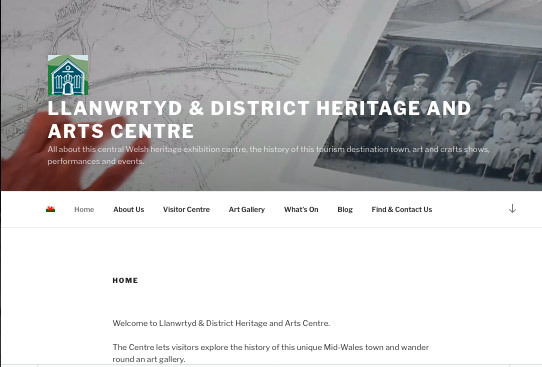 The domain history-arts-wales.org.uk was chosen for the website because it uses keywords people might use when searching for the subjects represented by the centre. This is a good tip to use when choosing a domain when the actual name of a company or organisation is not well known or hard to spell. For example, for another of our clients, a guest house in Snowdonia, we were able to secure the domain name guesthouse-wales.co.uk – bound to drive traffic for people searching for guesthouses in Wales! The website uses the latest theme from WordPress to be fully responsive, and a free version of the WordPress MultiLingual site plug-in to generate the Welsh version of the site. Contact us for more information on the cost of this for your own needs – it’s cheaper than you might think!